Honey, in a straw! These are standard-sized drinking straws, each containing approximately 1 teaspoon of honey. These straws are sturdy enough to bend in half without breaking. Bite the end just right, and it pops open to deliver a mouthful of slurpy sweetness. Five plastic drinking straws filled with honey and heat sealed for use in tea, coffee, or just plain honey. 50 plastic drinking straws filled with honey and heat sealed for use in tea, coffee, or just plain honey. 250 plastic drinking straws filled with honey and heat sealed for use in tea, coffee, or just plain honey. 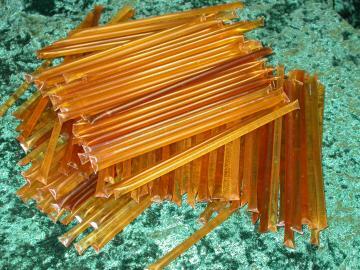 2000 (one case) plastic drinking straws filled with honey and heat sealed for use in tea, coffee, or just plain honey.